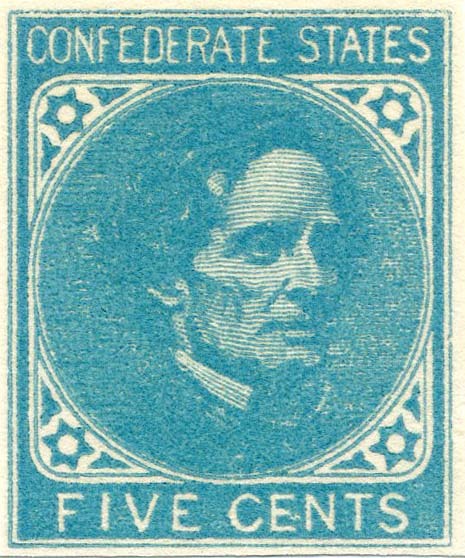 CSA 7-R, Richmond Print with white tie variety, and New York counterfeit. The London and Richmond prints are commonly confused, although with a bit of experience, they are generally not that hard to tell from one another due to paper, gum and printing characteristics. The New York Counterfeit is seen almost as frequently as the "real thing" and copies are offered and sold as genuine CSA 6 almost every day on eBay to the non-specialist. 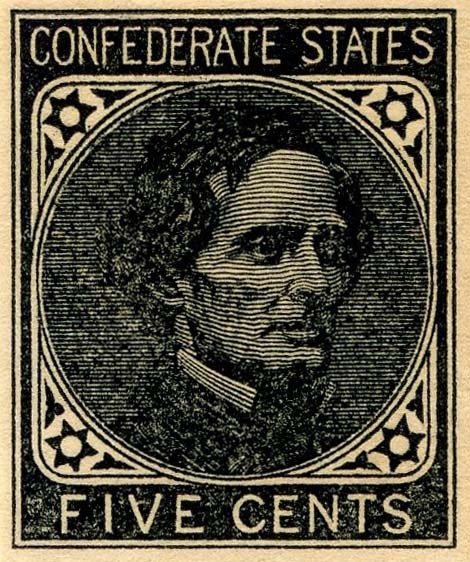 They are also found at virtually every stamp bourse and are offered unknowingly by dealers who do not specialize in Confederates. Your best defense is knowing the differences yourself. CSA 6, London Print: produced by Thomas De La Rue & Co. in London, England on thin hard-surfaced paper. The image was engraved in relief on steel, electrotyped and flat-bed printed. Impressions are sharp and clear and the ink is a consistent color from light blue to blue. The gum is thin, even transparent colorless gum. De La Rue shipped both the printing plates and a quantity of stamp paper. Consequently, there are Richmond prints that are very close to the same quality as the London prints. However, there are many that are quite clearly "local prints" , such as the second to the left example above, which has obviously filled in frame lines most noticeable at left and at bottom, as well as filling in the fine lines of the hair and a rather "muddy" appearance to the entire stamp. Not all Richmond prints will have the filled in frame lines, but if it does, then you can be assured it is not a London Print. CSA 7-L and CSA 7-R, Richmond Prints: printed by the Richmond firm of Archer & Daly from electrotype plates provided by De La Rue on white wove paper in two grades - the thin glazed paper from London shipped with the plates (CSA 7-L) and an inferior coarse grade of paper with colorless thin gum of an inferior darker hue (CSA 7-R). The color of the successive printings ranges from pale blue to dark blue to the darker cobalt blue. The impressions are coarse with many plate (constant) and printing (variable) varieties. One of the most collectible plate flaws is the "white necktie" shown above. The second from the left stamp shows a filled in left and bottom frame lines, a very collectible printing variety cataloged in the 2012 CSA Catalog. If the stamp you are examining has any printing defects, darker gum, or shows uneven application, large skips, or heavy brush marks, it is a Richmond print. New York Counterfeit: this commonly encountered forgery was printed from an electrotype plate by J. Walter Scott for use in the Scott albums in the early 1900s or possibly even the late 1800s. The master die was photographically reproduced from a print from the ten-cent altered plate (subject of another treatise) and the value in the tablet changed from "TEN" back to "FIVE". The first thing that jumps out at me personally is always the odd cloudy greenish-blue aqua color, which is nothing like an genuine stamp (far right stamp above). There is NO genuine shade like this. The next most obvious and decisive difference between the counterfeit and the original is the shorter crossbars on the "F" and the "E" of "FIVE" in the value at the bottom. When you compare them to the genuine Richmond print to the left, you will notice that they are always significantly shorter than the originals. Other things to notice are the lack of detail in the eye (very little white area) and generally lack of clarity and definition. The outer frame line is also thicker than on the originals. There are some other minor differences, but those presented here are more than enough for you to correctly determined genuine from counterfeit. 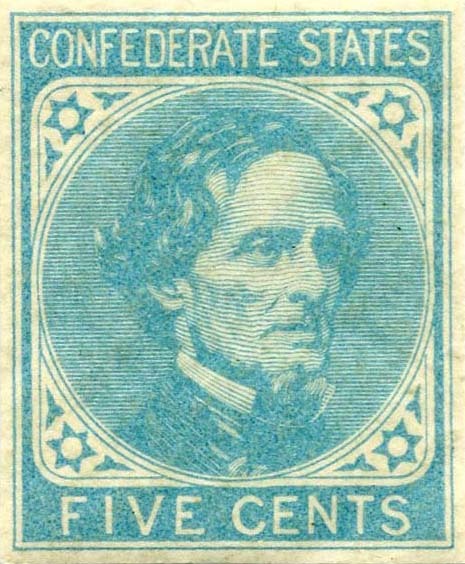 Philadelphia or Ward Private Printings: Printed in blue and black from a complete plate of 400 that was on board the captured blockade runner Bermuda. Prints were made by the Franklin Institute in Philadelphia in 1954 by Philip Ward. The sheets are ungummed. The stamp has a flat appearance and is dull and lifeless. Sometimes they are backstamped as well. The outer frame line is slighter thicker than on the genuine and the letters are not as thick. On some examples, Davis’ hair blends into the background. The original printing plate was sold by the Franklin Institute to the Smithsonian National Postal Museum in April 2011 and is on display in the William Gross Gallery. The non-specialist is likely to have a difficult time with these, particularly in the blue shade. Springfield and Swiss Facsimiles: This commonly encountered counterfeits are often on newsprint-quality paper and some are handstamped "facsimile" on the back. The facsimile is 1 mm narrower than the genuine stamp. They were "issued" by Tatham Stamp Co. of Springfield, Massachusetts in 1934 to the collective horror of the philatelic community. They were copied without permission from copyrighted pen and ink drawings made in 1919 by August Dietz, Sr. Seasoned students know them at a glance. Sometimes they have the old Scott numbers printed on the back, e.g., 205, 206, etc. They are seen literally daily on eBay, sometimes described as such and sometimes not. There are also other similar facsimiles of Swiss origin which are very similar but have the modern numbering system on the backs, e.g., 1, 2, 3, etc. Taylor / Woodcut Forgeries: These are very crude designs that bear absolutely no resemblance to the genuine and should fool absolutely no one when compared to genuine stamps or quality modern catalog illustrations. Examples can be seen in the Gallery of Curious Things on this website.